ChildChild age: 5-12 years. Under 5 are free. Experience the Boston Tea Party Ships & Museum® and relive the turning point in history that led to our independence and freedom as a nation. Open - 7 days/week. In Season Hours (Apr-Oct): 10:00am-5:00pm. Please allow 60 minutes to complete the museum experience. 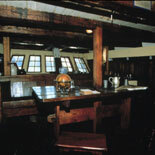 Museum Tour begins every 30 minutes throughout the day. 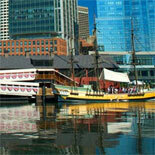 Boston Tea Party Ships & Museum®, is a registered service mark of Historic Tours of America®, Inc.
In-Season hours (April-November 3): first tour 10:00am - last tour 5:00pm. Please allow 75 minutes to complete the museum experience. 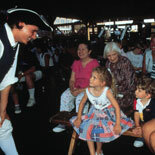 Museum Tours begin every 30 minutes throughout the day. Closed October 20th, Thanksgiving and Christmas Day. Congress Street and Dorchester Avenue. Child's age: 5-12 years old. Under 5 are free. For GROUPS (15 or more) -please call Group Sales at 617-531-6241 prior to your arrival in order to help better coordinate your group's visit and confirm tour time. Abigail's Tea Room open daily: 9:00 am to 5:00 pm. Souvenir tea cup is available for purchase with a pouring of hot tea included. Bakery items, as well as other hot and cold foods are offered, cafeteria-style throughout the day, at a per-item price. Please call 617-531-6239 for more information. 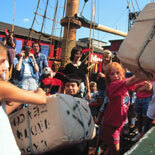 On occasion the Boston Tea Party Ships & Museum may close early for special events.